← What Do You Think of Gwyn’s Matching Travel Bags? 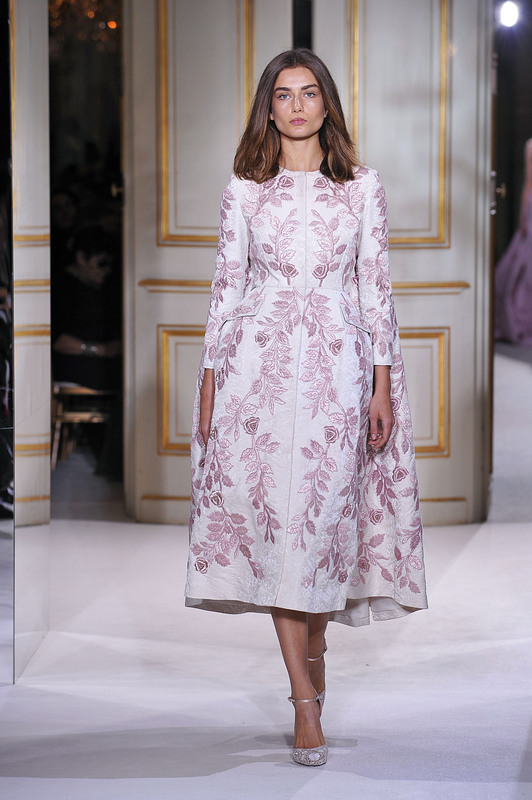 It’s Couture Fashion Week in Paris right now, with Chanel, Dior, Versace and Giambattista Valli among the designers offering up their most dream-worthy, one-of-a-kind creations. If you’re wondering what exactly “couture fashion week” is — and how it differs from the other fashion weeks happening in February and March — picture what you’d wear in your ultimate fashion fairytale. Or that amazing gray (or was it purple?) ball gown (you know, the one with the endless ruffles) that Carrie Bradshaw falls asleep in after moving to Paris for Alexander Petrovsky (see Season 6: Part II). Needless to say, the couture collections are filled with fashion eye-candy (and craftsmanship) of the highest caliber. And while most of us don’t have anywhere nearly that fabulous to wear such creations to, it’s soooooo much fun to ogle over them anyway! It was tough, but I narrowed down the couture confections to the top gowns I’d wear for my Cinderella moment in my very own fashion fairytale. 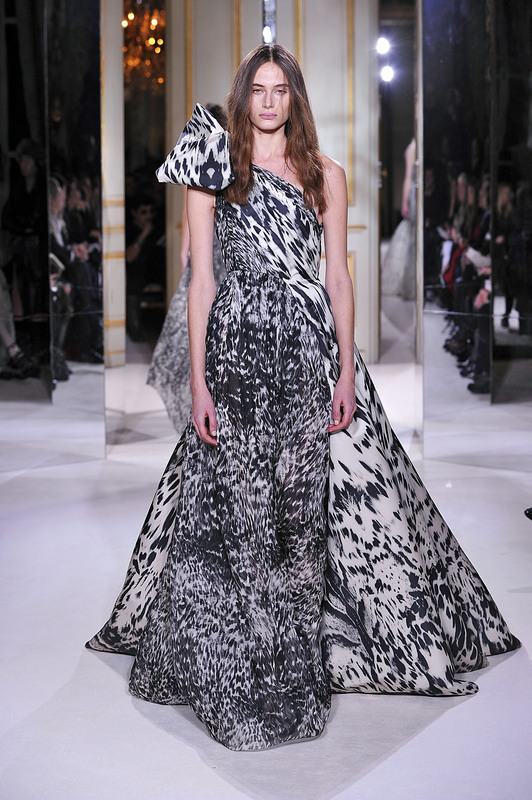 Hmm … could this Giambattista Valli gown have been the inspiration behind Jessica Biel’s watercolor wedding gown? Now these are some flowers I can get behind! 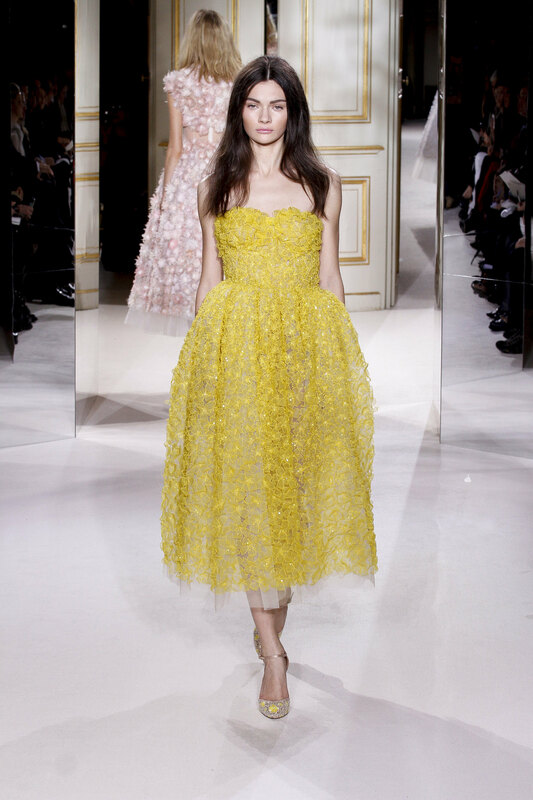 Thank you again, Giambattista Valli. I’m all about embroidery these days — and three-quarter hemlines. 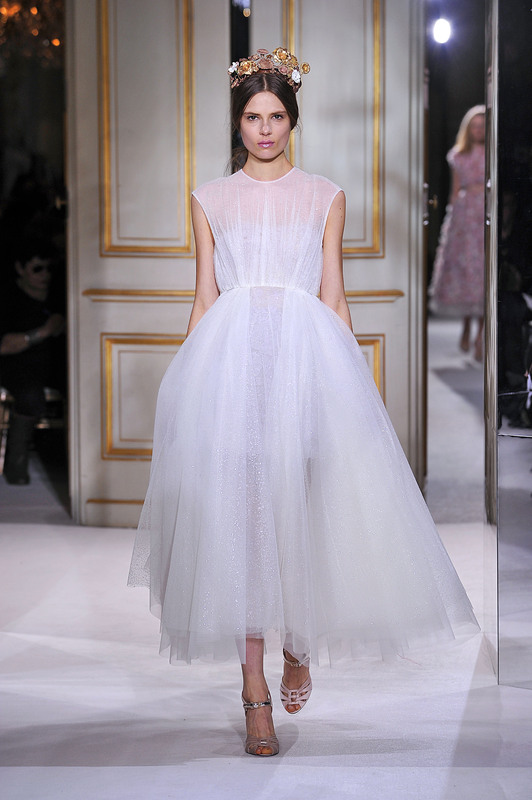 So basically, Giambattista Valli just introduced my Spring look. This is how I do ball gowns — downplay the showstopping elegance with a casual touch (aka the t-shirt sleeve) for an effortless vibe. 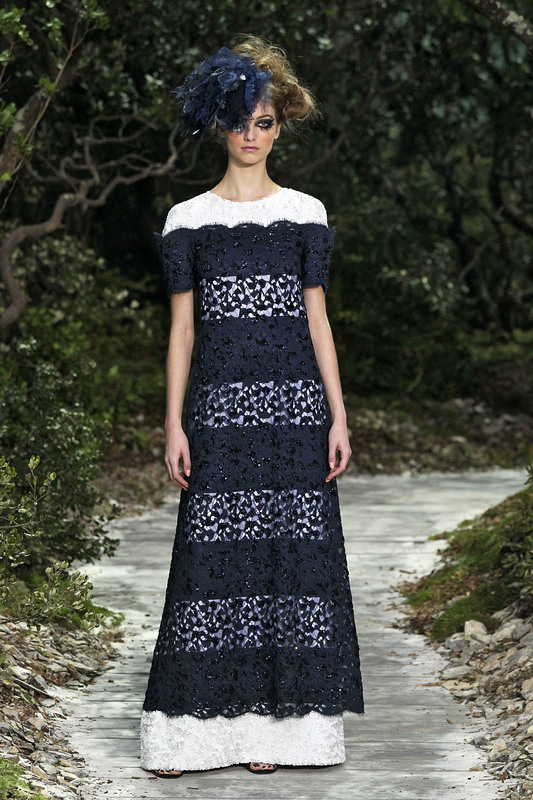 I could see Tory Burch wearing this Chanel gown, so maybe that’s why I’m so into it? I don’t typically like to go there, but this purple puff of perfection calls for an OMG. What I’d pay to have the chance to wear something like that. This has Diane Kruger at the Venice Film Festival written all over it. I think I’ve died and gone to couture heaven. Again, this has Diane Kruger’s lucky name written all over it. Hello, Kristen Stewart, meet your new best friend. Chanel’s sheer gown is far more elegant than some of those see-through styles you’ve been wearing lately. I think I want to wear this to my wedding. I know Penelope Cruz is far more likely to wear this to her next red carpet event. And this is what makes Karl Lagerfeld the king of couture. Coco Chanel would be proud. A ball gown with pants? Or pants with a ball gown? I don’t know what’s going on there but I like it. The front-slit is holding strong, playing peek-a-boo with pants now instead of a mini skirt. Sheer tutus are my new thing thanks to GV. This is perfect for Hollywood’s younger set. In case you’ve tried to ignore it, like me — yellow is going to be big this spring. Now if I am subjected to the hell that is known as being a bridesmaid again, I am so requesting this dress. 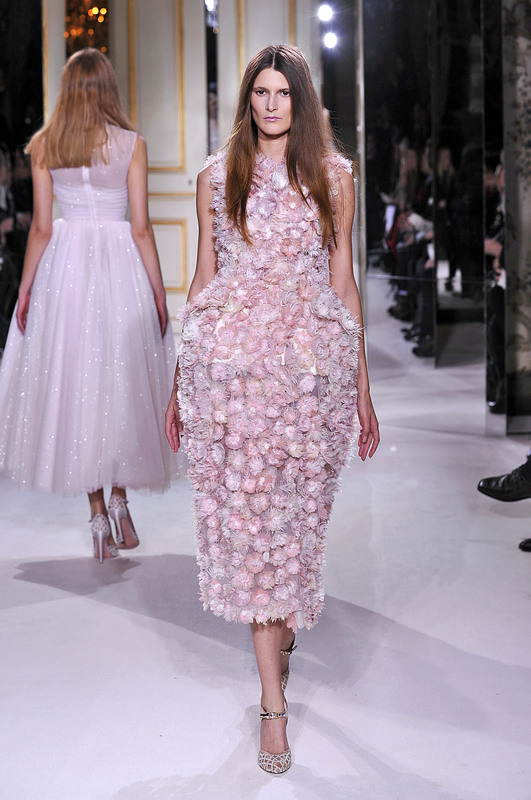 Brides-to-be (including moi): If you’re going to make your girls wear something pastel and girly, model it after this. The bow-embellished one-shoulder neckline is just the perfect way to wrap up this printed package. GV’s rock candy couture has me smitten. I love the almost 3-D construction of this skirt – it seems to come to life. And the black stripes create an eye-catching illusion and offset the pale pink ballet skirt to make this one of my faves from the Dior runway. Um, yeah, so I can’t believe I’m saying this, but I LOVE this dress. 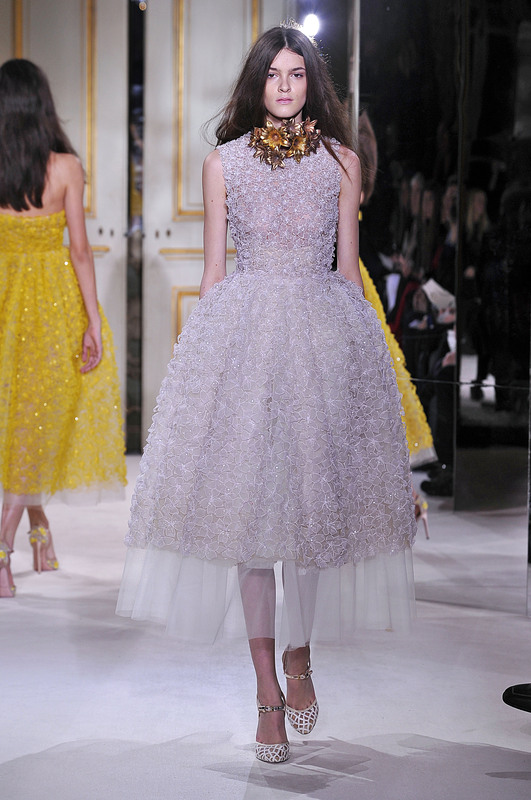 The thing about Dior’s couture collection is that, unlike Chanel, none of the pieces seem to fit together all that well. 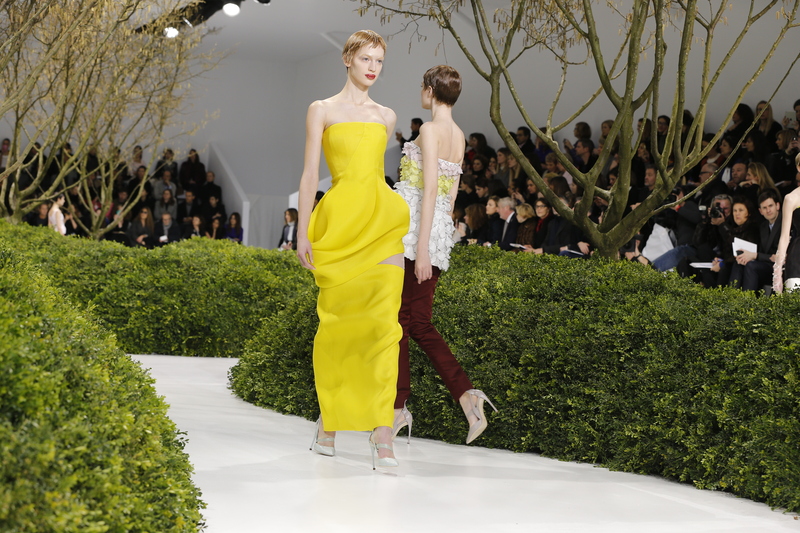 take this yellow column gown — the minimalistic design could be courtesy of Calvin Klein, but the pairing of the column silhouette with subtle architectural construction could only come from the genius that is Raf Simons, now at the helm of Dior. Ethereal, airy with subtle sparkle and just enough volume … I’m in love with this GV look as well. The modern girl’s ball gown. Gwyneth will likely be showing off her stems in this GV look.